Known for its old and traditional taste, Angelica Essential Oil is used as a flavouring ingredient in liquors such as gin, benedictine, chartreuse, triple sec. Its lovely colour and scent is also highly appreciated in jams and bakers’ confectionery. 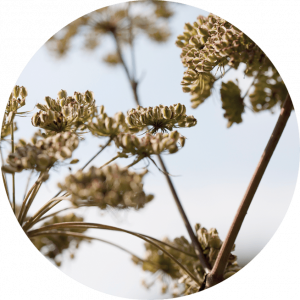 Angelica Seeds Essential Oil brings a fresh peppery note. Angelica Root Essential Oil has a musky and spicy note. In cosmetics, its fragrance makes an efficient masking agent. Angelica Essential Oil stimulates the digestive process and reduces digestive spasms. The oil has been recommended for treating a weak stomach or digestive system. It is also used to reduce accumulation of toxins. It is considered as a diuretic (promoting urination) and a diaphoretic (promoting sweating). It is a germ killer, excellent for coughs, colds, flu, muscular aches, fatigue, migraine, nervous tension, stress and rheumatism. It has also a relaxant effect reducing the impact of stress.